On Saturday, we flew back to Ohio after spending time in the beautiful state of Oregon visiting P.A.’s family. We were supposed to fly back on Friday, but our first flight was delayed, causing us to miss the connection to our next flight home. Thankfully, we were able to find out about our delayed flight well before we got to the airport, and re-book to fly out the next day. Airline travel for adults can be stressful. You pay an exorbitant amount of money to be scanned, questioned and stand in long lines for check-in and security, run thru large buildings, carrying several pounds of luggage, shuffling thru crowds of people, in and out of public restrooms, over-paying for any food you might need to purchase, only to most likely also have to deal with flight delays and cancellations, and end up squished into a seat like a sardine next to someone you do not know, who might even smell like a sardine or have some other weird habit you now have to deal with for the next three hours, while needing to use the bathroom within the first 30 minutes of the flight, but being denied access to the tiny port-o-potty because the seat belt sign is “still on” and you didn’t “plan” for the delay and drank too much water, so next time you “plan” to wear a diaper. It can be even more stressful when you add three wee Bab’s. For our flight out to Portland a few weeks ago, our seats from ORD-PDX were all mixed up and the five of us were spread around the plane. We purchased our tickets and chose our seats a few months ago, but the seats for our Chicago to Portland flight could not be chosen ahead of time online. I spoke with a customer service rep on the phone who told me we would need to take care of it at the airport. When we arrived at the airport, after rushing thru check-in and security, we got to the gate to find out the flight from CMH-ORD had been grounded. All the flights were delayed, so whew, we still made our connection. In Chicago, the customer service rep was very helpful to try and find us seats together, while also dealing with other problems caused by the delays and other travelers on stand-by, who needed to be re-routed because of the delays. She was able to find us 3 seats and 2 seats together, barring on the fact that we had to ask 1 of the passengers next to us if they would be willing to switch seats. It was confusing but she was very helpful and understanding. We were met with more help on the plane when the flight attendants gave us some *free* food to compensate for Adam having to wait on the plane for over 30 minutes carrying Selah in the backpack, while the rest of the passengers boarded, before he could ask if the passenger next to him would switch seats to his original seat, so he and Selah could sit together. In the end, it worked out fine with Adam and Selah in the back of the plane, while Soleil and Salem and I were about 10 rows ahead. After our flight was changed from Friday to Saturday, we were even more anxious to get on the plane and come home. We arrived early Saturday morning at PDX and were met with extra long lines, but made our flight with just enough time to grab our coffee and scones. The flight was smooth and the 3 1/2 hours we spent squished in the very back row of the plane flew by. After arriving in Chicago, we ate our over-priced but very tasty lunch, then made our way to the gate to discover that 4 of our seats on this flight were together, with 1 seat 6 rows behind the others. *side note* I still don’t understand why when we pay over $500 a ticket for 2 adults and 3 small children to sit together (previously declared on the passenger information and seats selected together online) we then find our seats to be apart. So, I went up to the gate and waited on the agent while chatting with another passenger who was on stand-by. Because of delays and flight problems on Friday, the Saturday flights were over-booked and people were at an all-time stress level. I approached the counter to ask if the 1 seat could be changed to be closer to the other 4 seats. “No, the flight is full” he responded in a robotic tone. That still didn’t answer my question, so I politely asked again. “Okay…” and I just walked away, feeling agitated with his short tone and unhelpful attitude; compared the other agent who shifted our seats around on our flight into Portland on that over-booked, delayed, messed up flying day. So I backed out of the line, pulling Salem and Soleil out of the way and moving our luggage to make way for groups 3 & 4. Then I said to the agent, calmly but firmly. Okay now I’m willing to admit that maybe… perhaps… possibly, I overreacted. I didn’t have to say anything, but I was thinking, every other flight we’ve taken this time and in previous years, the agent would call for those with small children or those who need additional time boarding to board with the earlier groups, even if your group number was later. The gate agent proceeded to ignore my comment and checked in 2 people from groups 3 & 4 and then called group 5. So I moved all our crap and 2 of our kids out of the way so that within a matter of 60 seconds 2 more people could board before us. Wow. I was so irritated at this point, and we were losing our patience. We just wanted to get on the plane, get home and be done with it. P.A. was behind me with Selah in the backpack and his luggage. As he handed the gate agent his boarding pass to check in, he asked “Sir, what’s your name?” The agent would not give his name and proceeded to check a few more people in. After I started walking down the ramp with Soleil and Salem to board, I turned back to find P.A. still calmly, but firmly persisting on asking the agent his name. The agent still refused. Both P.A. and I have spent our adult lives working with people and several years in Customer Service positions. We realize that everyone has a bad day and stress levels can be at the max. Regardless, we always had to give our name when a customer would ask. Regardless, Maybe… P.A. overreacted in persisting to ask for the agents name. P.A. explained the situation and told us to go ahead. Are you kidding me??? The TSA??? The Transportation Security Administration??? Really?? Is a man, asking for a name, while carrying a 2 1/2 year old on his back, really a security threat? I continued down the ramp to go ahead board with Soleil and Salem (who were worried about leaving daddy behind), feeling extremely flustered and angry. About 5 minutes later, P.A. and Selah boarded the plane. Everyone got settled in and I noticed and empty seat across the row from Soleil and Salem. I asked the flight attendant if my husband could move up, once everyone had boarded, if the seat was still available. He said “No.” I could feel myself getting upset again, not understanding, so I just asked, “So, there’s just gonna be an empty seat here?”. He replied and explained that the flight attendant he was training would be sitting there part of the time. AND, that it would be considered an “upgrade” to move anyone from the back to this seat, since these seats had up to 5 extra inches of leg room and people paid extra to sit in them. I thought to myself, really?? I didn’t pay any extra to be less of a sardine. These seats were just randomly assigned to us after we were re-booked from our flight delay yesterday. So, lucky us, I guess. 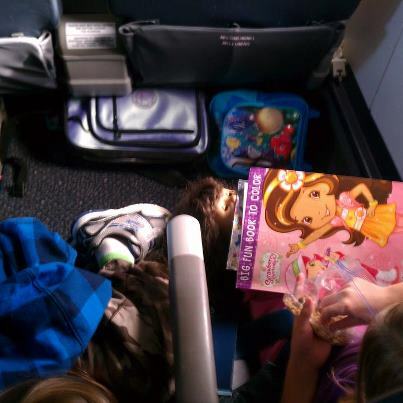 At least the kids got to enjoy some extra leg room. Really, I appreciated the flight attendant explaining to me the *reason* why Adam couldn’t move up and talking to me slightly above a robotic tone of voice. The flight was fine, and I had time to check myself and pray about my attitude toward the gate agent. Selah and Salem took naps, so I also had time to analyze why flying first class, business first, regular business class and now the *new* extra leg room class is the most ridiculous thing I’ve ever heard of. You can pay way more money to be slightly less of a sardine and get served your juice first, or pay an additional $49 and get 5 extra inches of leg room. That equals just about $10 per extra inch. wow. Aside from the cast system in India, I’ve really never heard of anything so ridiculous. 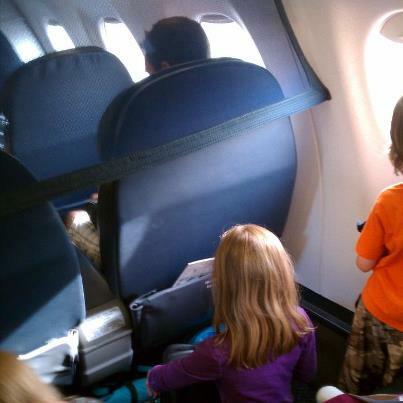 I am no longer a “frequent flyer” or on a “gold program” like I used to be when I worked for Women of Faith and traveled to their conferences… I am just a mom, with 3 wee Babs trying to visit their Grandparents, aunt, uncle and cousins once a year who wants to sit squished like a sardine next to her husband, instead of 6 rows away from him. Maybe I overreacted… but perhaps not? And maybe next time, we will just forgot the stress of airports, airplanes and gate agents and trade that stress for the family-fun of driving the 40 hours and 2,500 miles to travel to Oregon. Sure, there will still be stress… but we will enjoy the journey and try not to overreact. What stressful situations have you overreacted in? And if you’re perfect and never overreact, no worries, you don’t have to answer the question. You are one strong lady to control yourself through all of that. You are the person to talk to about traveling, that's for sure. As always I love reading about your real life struggles, joys & happiness. Love you!